Chokecherry's next public ritual will be February 1st (venue still to be determined), but many of us will also be involved in a Front Range Druid Players production for the Colorado Welsh Society on Saturday January 24th at the Kirk of Bonnie Brae - more details soon. Come and join the Druids of Chokecherry Protogrove, ADF, as we celebrate the Sun’s return on the longest night of the year. This year we celebrate the Norse Gods in an ADF style ritual. This site is a basement room accessed by a steep staircase, so plan accordingly. This is a family-friendly ritual which will last approximately 45 minutes. Please plan to arrive by 4:30 to allow for our pre-ritual briefing and attunement. Like all our rituals, this one will be followed by a potluck feast. As part of our community service this quarter, we're asking people to bring at least two cans for our food drive in addition to a potluck contribution. ...and it's time to prepare for Midwinter, also known as Yule. 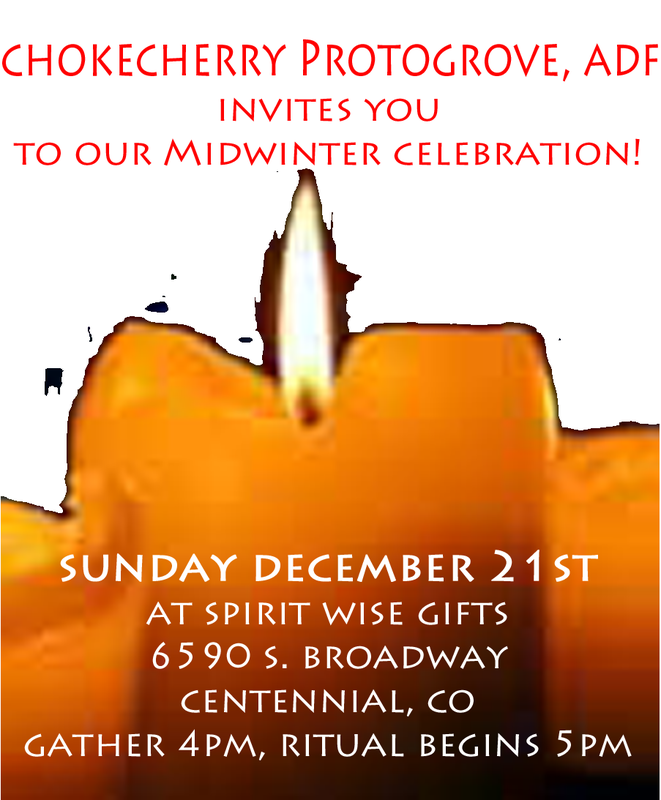 Our ritual this month will be held at Spirit Wise Gifts, located at 6590 S. Broadway in Centennial. Gather at 4 pm; the ritual will begin promptly at 5 pm. This site is a basement room accessed by a steep staircase, so plan accordingly. Like all our rituals, this one will be followed by a potluck feast. Winter arrived with a bang here in Denver last week. Several snowy days combined with record-breaking Arctic cold weather left us in no doubt as to the change of seasons. Ahead of us lie a variety of winter holidays, both mundane and religious, of which Chokecherry's next High Day - Midwinter - is one. We hope to be moving to an indoor location for this ritual, and if we will be sorry to miss our blazing Sacred wood fire, we look forward to concentrating on the ritual itself without the discomfort which comes from standing outside in freezing weather. More on this soon - in the meantime, may we all feast in joy with out families and our remembered ancestors on Thanksgiving! Traditionally Samhain - modern Halloween - was a multi-day festival marking the last harvest of autumn and the beginning of the Celtic winter season. Its modern Welsh name - Calen Gaeaf, "first day of winter" - reflects this. For us here in Front Range Colorado, the seasonal dynamic is apt; the last few days have been surprisingly warm, but tonight we are expecting a hard frost. The multi-day aspect is with us, too - Chokecherry celebrated Samhain yesterday with a beautiful public ritual at the home of one of our members, while other groups are celebrating next Saturday. And of course, there's mundane Halloween in the middle, plus various other private and public parties. All in all, it's truly Samhain week - a last celebration of abundance before the cold and dark of winter set in. Enjoy, and don't forget to set your clocks back next weekend! Chokecherry is now hosting a Google calendar showing Front Range Colorado Druid activities. Check it out via the sidebar link (ADF-Colorado Druids Calendar). Chokecherry has been busy planning and growing in the last month. Our next ritual - Samhain - is coming up soon, on Sunday October 26. Due to the changing season, we're moving to a different location for this one, and also a different time. The ritual will be held at a private residence, allowing us to go inside afterwards if the night is cold. Our celebrant Kevin Jenkyns describes it thus: "As the days grow short, we find ourselves looking for shelter from the vicissitudes and inclemencies of the weather. To that end, Chokecherry ProtoGrove will be holding their Samhain Rites at 2929 South Elm Street, Denver 80222 on October 26th. The time will be forwarded later but it will be an evening event. Our intention is to hold the Rite out of doors so dress accordingly. However, fear not, for we will have the option to retreat indoors should the need arise. Gather with us as we enjoin with the Honored Dead." As part of our community service this quarter, we're asking people to bring at least two cans for our food drive in addition to the usual potluck contribution. We're planning to gather at 4 pm and start the ritual at 5 pm as the daylight wanes. Come join us at this feast for the Ancestors! 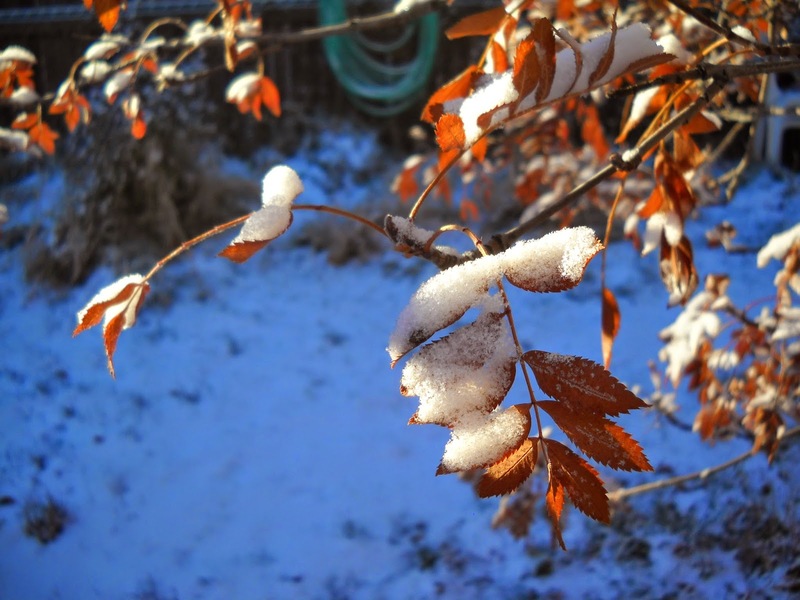 The last month has been busy for Chokecherry! After performing at the Elizabeth Celtic Festival as 80% of the Front Range Druid Players, we followed this up with several important milestones for our little protogrove ("protogrove", btw, is an ADF term for a small new local group). On August 1 our protogrove application was approved by the organizing committee, making us an official part of ADF, and allowing us to affiliate with Chokecherry through the ADF website. We now have five members who are also paid ADF members - an impressive start for a new group. Three of us, moreover, are already experienced celebrants and liturgists - an almost unheard of situation. Following our approval, we held our second public High Day ritual at Overland Pond Park - First Harvest, or Lughnasadh. The deities honored this time were our bountiful Mother Earth and the Corn King, also known as John Barleycorn. Seventeen people attended and shared fellowship in ritual and afterwards on a relatively mild Denver summer day. The last act of our busy month was another performance of "Blodeuwedd, or the Betrayal of Lleu" at the Colorado Scottish Festival, once again sponsored by the Colorado Welsh Society. Some of us will also be at the Long's Peak festival next month in Estes Park - stop by the CWS booth if you'd like to chat or get more information. From time to time over the last two or three years some of us from Chokecherry and other local ADF groups have got together to put on short plays based on Welsh medieval stories from the Mabinogion. Next Saturday we plan to do one again at the Elizabeth Celtic Festival. The play will be "Blodeuwedd, or The Betrayal of Lleu", a tale of magic, lust, and murder, and will be hosted by the Colorado Welsh Society booth. Look for us there! A Druid Ritual - Part 1. A small private nemeton, showing the firepit, altar and tree. Some of you may be wondering what you will see if you join us at one of our High Days. What, indeed, makes up an ADF Druid ritual? Think of it as a series of concentric circles. In the outermost circle, we first create our sacred ritual space. Unlike many Pagan traditions, we do not cast a circle to contain the energies we plan to generate. Instead we purify ourselves and our ritual space, usually through water and smoke (representing fire). 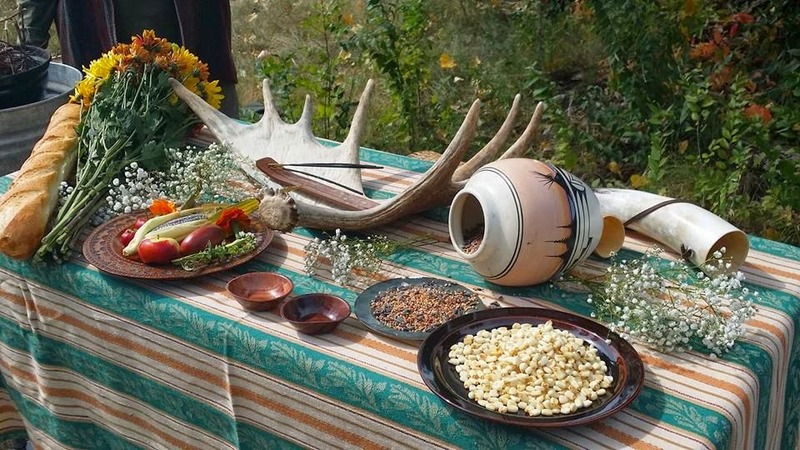 We make offerings to Mother Earth and (often) to the Spirit of Inspiration, and frequently we send a gift or bribe outside our ritual area to those ill-intentioned spirits we call the Outdwellers, asking them to take it and leave us in peace. Our next circle of ritual places us in contact with the Three Realms: the Underworld, home of the Ancestors; the Middle World, which we share with the Spirits of the Land; and the Upper World, where dwell the Shining Gods and Goddesses. Through our own magic and offerings, we create Gates to these realms in the shape of our Fire, Well, and Tree. Then, with the aid of a God or Spirit called the Gatekeeper, we open those Gates. Having created our sacred space, and connected it to the Three Realms, we come to the inner circle, the center of our ritual. ADF worship is based on the old Indo-European idea of reciprocity: we give gifts to our Gods, and expect (or at least hope) that they will give to us in return. Our gifts take the form of offerings to the dwellers in the Three Realms, usually offered through the Fire or poured out on the ground. Having given them, we first ask for an omen, and then (assuming the omen is favorable) for the Blessing of the Gods and Spirits, in the form of one or more cups of blessed liquid (called the Waters of Life) which is shared among all participants. Having reached the climax of our ritual, we end as we began. First, as good hosts, we thank our mighty Guests for their gifts and their attendance. Next, we close the Gates between the Realms and thank the Gatekeeper for his or her aid. And finally, we deconsecrate our ritual space, returning our Fire, Well, and Tree to their original nature. With that, we thank the Spirit of Inspiration and Mother Earth for their aid, and the ritual is ended – until the next time. There are more details involved in all of these steps, of course, and I’ll write more about them another time, but this post has covered the basics of an ADF ritual. In the meantime, feel free to ask questions – or to join us and see for yourself! Today is the longest day of the year, and Chokecherry Incipient Protogrove will be celebrating Midsummer at Overland Pond Park tomorrow - not much difference, as tomorrow will only be 3 seconds shorter here in Denver. Why do we call it Midsummer? Because in the old Celtic calendar it lies halfway between Beltane (May 1st), when many summer activities began, and Lughnasa (August 1st), the beginning of the harvest season. This is still reflected in the Welsh name for July, Goffennaf - "Summer's End". So a happy Midsummer to you all! 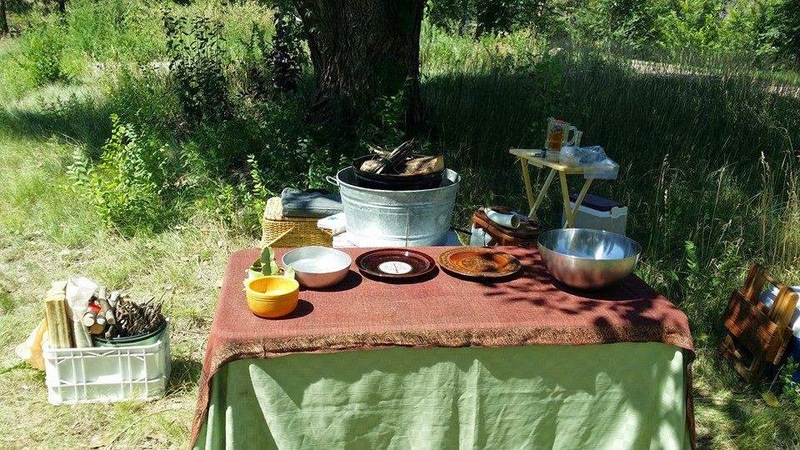 For those of you who can't make it to Mountain Ancestors' Saturday ritual, or would like to celebrate both days, a reminder that Chokecherry Incipient Protogrove will be holding our first public ritual on Sunday June 22nd at Overland Pond Park, 955 West Florida Avenue in Denver. We'll gather at 11 am, and the ritual will begin at noon. Our Indo-European ancestors frequently honored the spirits of their local rivers as gods or goddesses. Following in their footsteps, we will honor our local stream, the South Platte River, during our Midsummer Ritual, which will be held Sunday June 22nd at Overland Pond Park on her east bank. Denver is located near the south end of the South Platte, which drains much of the northern Front Range, and flows over three hundred miles before joining the North Platte in Nebraska. Truly we should honor her as the mother of our land!